My birthday is in December. I have heard lots of December babies lament the fact that their special day is overshadowed by Christmas, but I think it's awesome. Any present on my wishlist I do not receive for my birthday inevitably ends up beneath my tree come Christmas morning. It's instant gratification and I love it. And because my birthday and Christmas fall in the same month, I go crazy with decorating. Everything inside and outside of my house must scream "THIS MONTH IS SPECIAL!" So, this year just before my birthday I wandered into Tai Pan to find something festive and not too expensive when I saw an eyesore of a Valentine's Day display. It was mid-December and we were already being sold to for February. This impatient marketing scheme happens all the time! You know, the August Halloween displays, the plastic Christmas tree aisles in October (How does that make Thanksgiving feel?? ), and happening in a supermarket near you, Easter Candy in February. That is the long explanation as to why I have mini Cadbury eggs in my post. 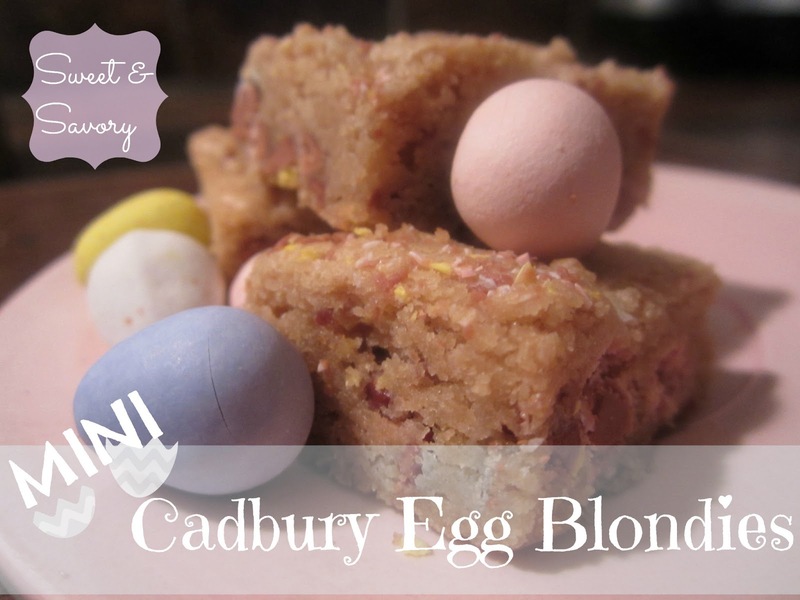 I don't particularly enjoy them right out of the bag, but baked in a blondie, now that's a different story! For those of you who don't know, blondies are brownies without the chocolate. They have the same chewy, dense texture, and like brownies, they are amazing with any mix-in imaginable. Dark chocolate peppermint blondies, coconut butterscotch, peanut butter white chocolate, the flavor possibilities are endless! Today, I choose these. I love the color they give the blondies. You have a light caramel colored square with little pops of soft pastel peeking out at you. Very cute. Very irresistible. This recipe can be made in one saucepan, yes saucepan, and does not require a stand mixer. Preheat your oven to 350 degrees Fahrenheit. Cut an 8x8 square of parchment paper. You can measure using a ruler or just trace the bottom of your baking dish. Spray the 8x8 baking dish with cooking spray. Lay two long strips of aluminum foil in the pan, forming an X. I tear a long sheet of aluminum foil, cut it in half, then fold each half into thirds. This forms two reinforced strips. Leave a few inches of foil hanging off the sides to create "handles." Lay the 8x8 parchment paper square over the foil. Spray the parchment with cooking spray. This parchment/foil apparatus will allow you to lift the entire batch of blondies out of the pan after they are baked and cooled, making it very easy to cut them into neat, even squares. Now, on to the blondies! In a medium saucepan over low heat, gently heat the butter until it is almost completely melted. Remove from heat and whisk until the butter is completely melted. Let cool slightly. While you wait for the butter to cool, spread your cup of Cadbury eggs onto a cutting board and chop! Now that the butter has cooled down, add brown sugar and whisk until smooth. Whisk in vanilla and egg until batter is smooth and glossy. Using a rubber spatula or wooden spoon, stir in flour and salt until just combined. DO NOT overmix. Fold in the Cadbury egg pieces. The batter will be thick, almost like cookie dough. Press the blondie batter into the prepared pan and bake for 22-25 minutes. The edges of the blondies will be golden brown and the center should be set. Let cool completely. When cool, use the aluminum foil "handles" to lift blondies out of the pan. Cool right? No digging blondies out of the pan for you! What's that? A corner of my blondies is missing? That's strange....Anyway, I like to cut my blondies into strips, then into small squares. These are chewy bites of crunchy, chocolatey perfection! Preheat oven to 350 degrees Fahrenheit. Spray an 8x8 baking dish with cooking spray, line with aluminum foil and parchment paper (see above). Spray parchment paper with cooking spray. In a medium saucepan over low heat, gently heat the butter until almost melted. Remove pan from heat and whisk butter to melt completely. Let cool slightly. Meanwhile, roughly chop the Cadbury eggs. Whisk the brown sugar into the cooled, melted butter until smooth. Whisk in vanilla and egg. Using a rubber spatula or wooden spoon, stir in flour and salt until just combined. Fold in the Cadbury egg pieces. Press blondie batter into prepared baking dish. Bake for 22-25 minutes or until golden brown around the edges and set in the middle. Let cool completely, then use aluminum foil "handles" to lift blondies completely out of pan. Cut into small squares and serve. Um... delicious. These are my favorite holiday candy, and this might now be my new favorite treat. You rock!